This monument combines grandeur and solidity of construction with themost delicate and refined style of artwork; it also displays some original traits. We may see here the symbol of the greatness or Roman Syria, in as much as it immortalized the city of Bosra. Archaeologists are in accord in regarding the theatre as an expression of an advanced civilization, and the theatre at Bosra is considered one of the best-preserved of these historical monuments, in spite of time's destructiveness. A sense of equilibrium underlines the construction of its separate parts, and evident in the proportions, dimensions and decorations. From whatever side the visitor may view it, he sees that harmony, sobriety and delicacy are manifested in every detail. It is on of those rare monuments which has caught the attention of travelers ad archaeologists in many centuries. Here is what Rey said in his book of 1854 , Le Voyage dans le Hauran: "a military theatre, which cannot fail to excite our archaeological curiosity". And this is what the Comte de Vogue wrote in his work, la Syrie Central :"built in the Roman Age, undoubtedly in the second century of our era, of colossal dimensions, this structure is admirably preserved, and, if is were cleared of the modern buildings which intrude upon it, it would reveal to us more than any other ruins now extant, either in the East or in the West, the interior design on an ancient theatre. The seats, of beautifully dressed stone, are almost all in place. The skein is complete, with proscenium, postscenia, and attendant structures; it is decorated with niches and monumental doors ornamented with moldings. 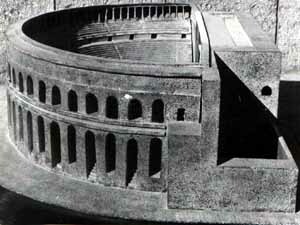 A portico extends along the entire circumference, at the top of the seats, and forms a covered gallery which adorns the whole building: this feature is known to have been a part of all Roman theatres, but all others have disappeared. The topmost gallery, or covered promenade, was the only part of the theatre which has open to women, although in some theatres this rule was less strict. I do not believe that there exists, apart from Bosra, an extent portico; the numerous columns here are still upright, with their architrave, all of the Roman Doric order. The line which is formed by this colonnade is extended to the wall of the skein by a series of engaged half-columns. One segment of this is still visible, where it meets the lower level. 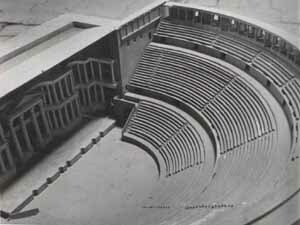 We may see at the center of our plan the entry to a vomitorium and the double stairway which puts the stage area in communication with either the outside, or the upper sections of seats ". The most important study which has been made of this theatre is in the work of Brunnow, Die Provincia Arabia. This is a detailed study with plans and section drawings. Brunnow was the basis of other studies until 1947 . but since that date, under the direction of Emir Dja'far, then Director of the Antiquities Department, work was undertaken to excavate initiated; the results obtained have been immensely encouraging. The new knowledge gained from this study helps to clarify the history of these structures, while allowing us to advance new hypotheses and confirm older ones. in addition, this work had the immediate effect of bringing to light a large section of the theatre hitherto inaccessible . It can now be seen that the study and the drawings of Brunnow had been superficial and at times even erroneous in the overall view as well as the details. But it is understood that the reason for this was the rapidity with which he made the study. By a happy coincidence the sections of the theatre now missing of badly preserved do not prevent us from reconstructing the entire building in all of its details . Since these Syrian theatres had been copied (not without certain innovations) from Hellenistic and Roman models, it is logical to conclude that the former follow the same system of stage production as the latter. Troupes of actors had a leader, subsidized by the government, who decided what plays to perform, when he had chosen a particular play, he would demand a certain price from the governor, but if the audience reacted unfavorably to the play, the head of the troupe had to repay that sum to the governor, and the actors would receive no reward for their efforts. Admission to the theatre was free; an official was responsible for the seating arrangements and the maintenance of order during a performance . Other research leads us to believe that the Nabateans, who settled in Bosra before the Roman conquest, celebrated the return of the Olympic Games every four years. Delegates from every city were invited here to take part in these celebrations, and to make offerings to the well known Nabatean god, Dusares. These religious ceremonies were followed by performance given in the honor of those inhabitants of Bosra who had distinguished themselves by some act of bravery or some invention in the different branches of science or art. We may imagine them receiving a prize or a laurel crown in the midst of the thunderous applause from thousands of spectators . It is not certain that the theatre of Bosra was built on the site of an ancient Nabatean citadel, as Clermont – Ganneau thought. The foundations are raised nearly 20 m above ground level and are hemispherical in shape. The centre of the hemisphere (the cavea) is oriented to the north with a slight inclination to the east, it is one of the rare theatres in the world in the senses that it is not built into a hillside or in the flank of a mountain. The theatre of Bosra adjoins a wall pierced by windows and doors. The entrance and exit are seen to be truly enormous facilities, especially since it is estimated that the theatre could seat more than 15.000 spectator. It is divided into three sections, separated by large galleries, bounded to the right by the backs of seats, whereas to the left are the exit doors (vomitoria). The building is surrounded by a covered portico; the columns of this arcade are of the Doric order, of which only two remain in the north wing. (Antiquities Department has restored two others next to the ones in place, and has replaced four others in their original location) . The upper part of this theatre is composed of four tiers, the part toward the centre, ten tiers, while the lowest section, which is also the largest, has at the moment a dozen tiers. The excavation work is not yet complete, and it is estimated that the total number in this section will exceed eighteen . From the skein we can see three large doors: one reserved for foreigners, another for the people of Bosra, and the third for the upper class of citizens. The skein measures at the interior 45.5 m and at the exterior 54.35 m.. The circumference of the hemisphere is 102 m. Behind the skein doors a long gallery, corresponding to a backstage area, was equipped for actors awaiting their turn to enter the stage. Lower than the skein (which was raised 1.5 m to be level with the lower tiers of seats), a semicircular area (the orchestra) was reserved for musicians or actors. This part of the theatre is still blocked by Ayyubid construction . rows of columns and Corinthian cornices, which helped reinforce the actors voices. We may still see some of these columns under the western vaults in front of the skein wall. Some of these columns still support entire sections of cornice and roof-like projections . Also visible under the eastern vault wall, on the right side are five box seats reserved for special guests. The corresponding seats on the opposite side are still hidden by an Ayyubid wall. One should note the second box seat by the gallery which borders the central section of the theatre. Inside, two seats of basaltic stone remain in their original location. And a window at the back of the box gives a view of square staircase; a small fragment of stucco is still in place on the wall . In front of the eastern vault wall at the centre of the theatre, where the columns are arranged in a single row topped by a cornice, we may still see some fragments of marble which decorated the upper part of the entire theatre. We know, incidentally, that the theatre had been covered by printed silk awnings which gave protection from the sun in Summer and from rain in Winter. Only the roof of the skein had a wooden covering. One may visualize a fashion common to Roman circuses and theatres: the use of perfumed water. This is sprayed in the air, the vapors were trapped by the awning, and subsequently fell in a fine mist on the heads of the spectators .